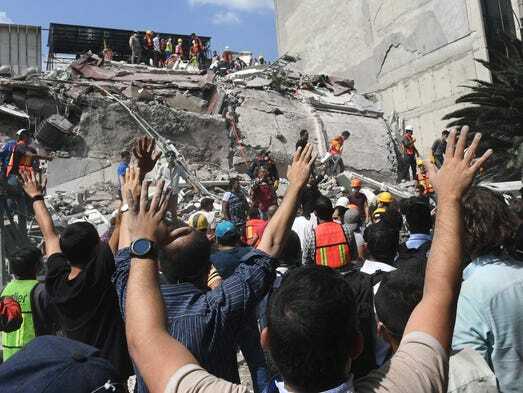 10 days later, new massive #earthquake in #Mexico. Is the Big One next? 10 days later and they had a new huge earthquake in Mexico. This time in Puebla, eighty miles close to the capital, Mexico DF. It was 7.4 magnitude and made several buildings to collapse. I think the death toll is going to be a lot higher than in the previous one… 248 dead people so far… Did you see the images??? Holy crap! What a horror! It was so impressive to see how everything was moving. It must be so horrifying to experience it… I’m so sorry for the victims. My heart is with them all. And what a creepy thing! This one took place the same day that 32 years early, in 1985, took place the terrible one that killed thousands. What a hellish coincidence, right??! But did you notice one thing??? Do you see what’s going on here??? It looks like there is some sort of a patron. Look… first took place the 8.4 seism in Chiapas, South of the country, it was 10 days ago. Yesterday, September 19th, it happened in the Puebla and DF area of the country, around 450 miles North… It’s pretty evident that earthquakes are moving North… And my question is, and it’s not new, should be waiting for the Big One to hit California soon??? I’m afraid so… In 10 days or so, maybe, if following the patron. This line of mine is going to be a classic soon, but I have to say it, even when facts at the end keep giving me the reason… I just hope to be wrong. Entrada anterior10 días después, nuevo #terremoto masivo en #México. ¿Es el Big One el siguiente? Entrada siguiente¡Y ahora Japón también se mueve! ¡El Anillo de Fuego echa chispas!